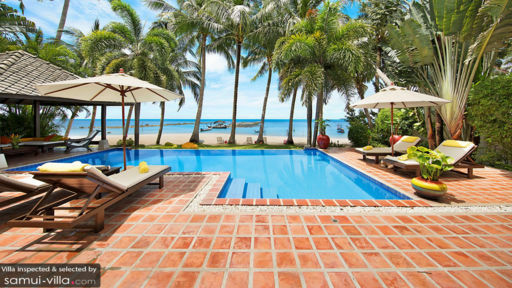 With private beach access, right out front, and a stunning holiday villa with outdoor lounge space as well as a personal swimming pool, living it up at Ban Laem Sor in Samui would be an exciting way to spend your holidays. Overlooking the islands of Taen and Matsum, the beautiful location of this villa is a great plus point as you can explore most everything on the island with ease. For a beach vacation, what more than your own beach to make it more than simply perfect! Divided into four individual pavilions, the villa caters to the needs of a variety of groups making it great for families, friends, and even corporate off-site trips. 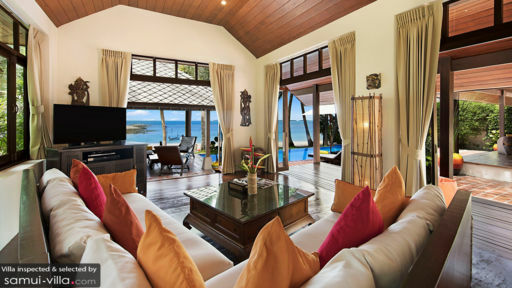 The villa hosts four bedrooms, of which two are master suites that are located nearest to the ocean besides the living pavilion. Both bedrooms have double beds and individual en-suite bathrooms. The other two bedrooms are located beside the dining pavilion and form a family compound with a shared bathroom. While one is furnished with single beds, the other one is fitted with a double bed. Each bedroom opens out directly to either the swimming pool or the connecting path so you can move around with much ease. They are spacious and feature wooden flooring that only adds to the warm ambiance present in the rooms. As you relax on the many sun chairs found on the pool deck, what you see is exactly what you get. There is indeed an azure blue private swimming pool across which stand towering palm trees dotting the periphery. Beyond this mass of wonder is the sandy beach and the turquoise ocean water, just waiting for you to dive straight in. The garden itself has several bean bags for lounging to enjoy the view that is all yours! You can take out kayaks for a swing on the waters, to complete this stunning outdoor experience. Beach chairs are perfect for sunbathing, or you can enjoy an alfresco meal beside the ocean. Relax on the daybeds housed in a traditional Thai sala, ideal for dozing off during the afternoon. Besides the close to perfect outdoor setting, Ban Laem Sor is even better from the inside with open-plan living and dining spaces that allow you to enjoy the ocean view even while you’re indoors. Absolutely comfortable with plush sofas, a TV, reclined chairs, and glass doors opening out to the deck, the living room is a nice place where you can retire to once the sun sets. Housed in another pavilion is the dining area and kitchen at the villa with an eight-seater dining table as well as a fully-equipped kitchen with modern amenities and an island counter for convenient cooking. Leading out to the stone path that connects all the pavilions, each of these pavilions are airy, breeze, and flooded with natural light. The villa is fully-serviced and even offers amenities like a garden BBQ to make you day even better. Daily housekeeping and maintenance is provided to keep the villa in super condition. You can opt for massages in-house and even request for any special arrangements for weddings or private events. A guest manager oversees the functioning of the villa and you can even request for a personal chef for ease! Ban Laem Sor is perfectly suited for a laid-back and relaxed beach vacation with friends or family, wherein the most you need to worry about is the number of pina coladas you can chug. With the beach right in front and accessibility to water sports, you can easily make the most of your time frolicking in the water and on the sandy beach! We have just returned from our Thailand trip, and whilst we are absolutely exhausted, I just had to take a moment to thank you for helping us with the booking for Ban Laem Sor. The Villa exceeded out expectations, with its idealic setting, and attention to detail. However, the highlight was no doubt the wonderful Rung and her husband Mai (apologies if the spelling is incorrect). Rung always had a smile on her face and never let a bunch of loud Aussies bother her. Nothing was too much trouble, and no request was unable to be fulfilled. Please pass on our warmest regards to Rung and her family, and thanks to you for all the assistance. Just wanted to let you know we had a great time at Ban Laem Sor, the team K. Ei, K. Rung & K. Mek) were excellent, really helpful and went out of their way to make our stay an enjoyable one. We also loved the chef you managed to find us, so all in all it was a great vacation. Thank you for all the prep work leading up to our vacation. We'll definitely be back.